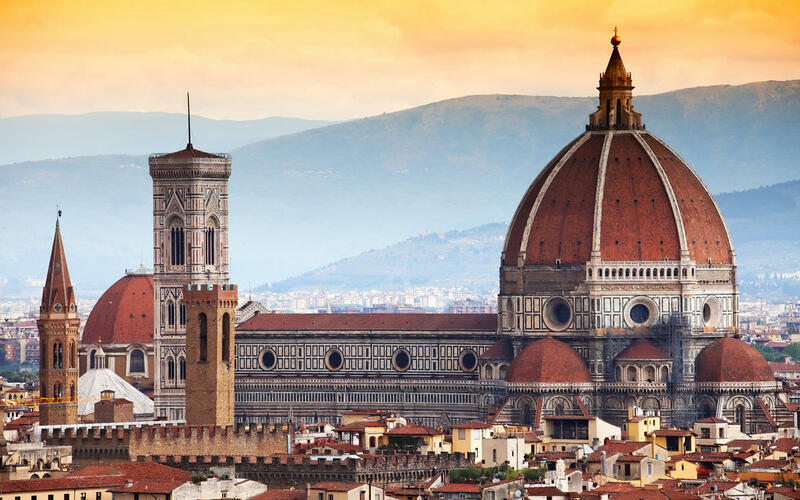 Accessible dome of Florence - ROME AND ITALY | TOURIST SERVICES IN ITALY! The church of Santa Maria del Fiore, whose construction was assigned to Arnolfo di Cambio, is the third biggest church in Europe, after St. Peter’s in Rome and St. Paul’s in London, and was the biggest european church at the time it was built in the 1400’s: it is 153 metres long, 90 metres wide and 90 metres tall. 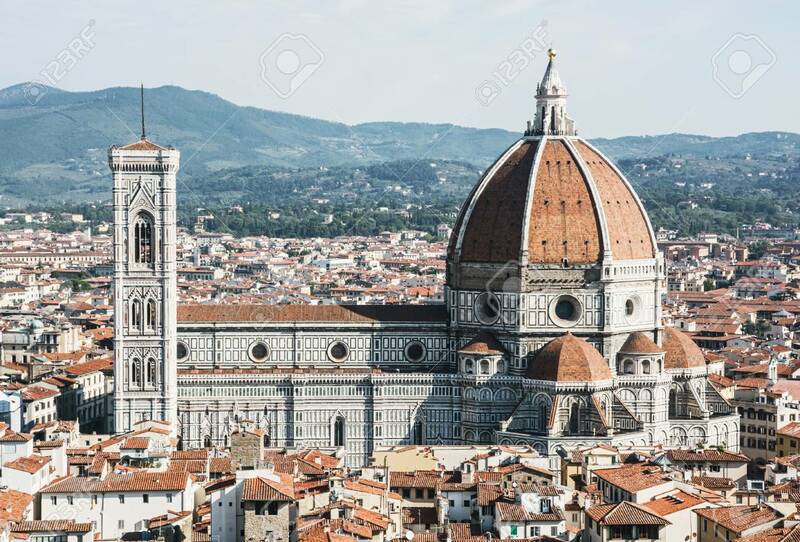 Its name, Santa Maria del Fiore, is a clear allusion to the lily, the city symbol. The first stone of the façade was laid on September 8th, 1296; the architect Arnolfo di Cambio worked on his project from 1296 to 1302 and intended to build a church which had a classical style, with three wide naves all headed to the main altar, surrounded by tribunes upon which the dome would later be placed. At Arnolfo’s death in 1310 the works slowed down until 1334 when Giotto became the head of the project until he died just three years later; then came Andrea Pisano who worked on it until 1348, year in which the black plague decimated the population of Florence that was reduced from 90000 to just 45000 people. A new project for the church, proposed by four architects and four painters, amongst them being Andrea di Bonaiuto; Benci and Andrea di Cione; Taddeo Gaddi and Neri di Fioravante was finally accepted in 1367. 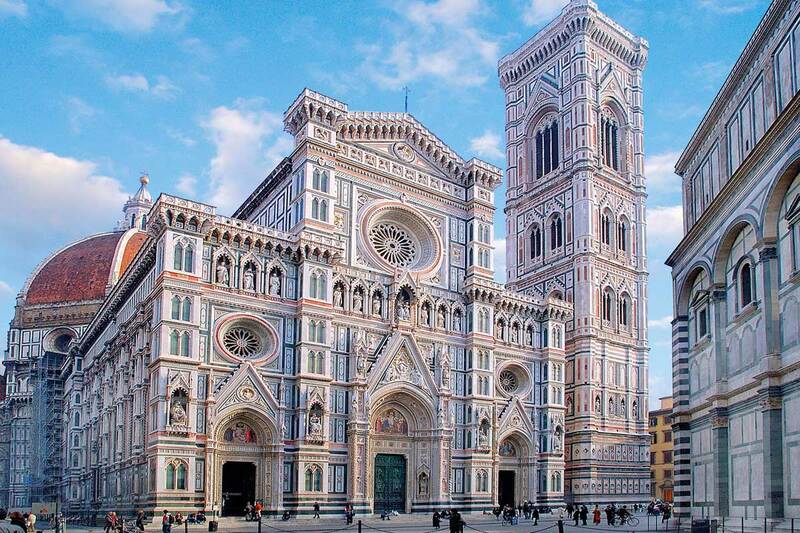 In the nineteenth century a series of changes were made, most importantly the building of the new choirs of Santa Maria del Fiore and the removal of the statues and columns from the old choir, made by Baccio Bandinelli. The most important work of this period was the finishing of the façade by Emilio de Fabbris and his coworkers between 1871 and 1884.